Even though this set is titled "For the Graduate" and I really clung to this verse during my college years, it's a wonderful verse any time there is a tragedy or the future seems bleak. We went to a funeral last week and it was heartbreaking for the girls who lost their father. We know His timing is perfect and He has a beautiful plan but the pain is still there...and so is He. To see all the creations in one place or join the challenge, click here. You have until August 31, 2014 at 8:00pm EDT to join us. By participating in the challenge, you have a chance to be placed in a monthly drawing to win a $15 ODBD Gift Certificate good towards the purchase of stamps in the “stamps column” on the ODBD website, or to be spotlighted on the ODBD Blog at our next challenge. The random prize winner will be posted on the first challenge of each month.We would love to see your creations. Diana, this is one of my favorite verses. It is so comforting to have God to trust and rely upon. Your card is stunning!! 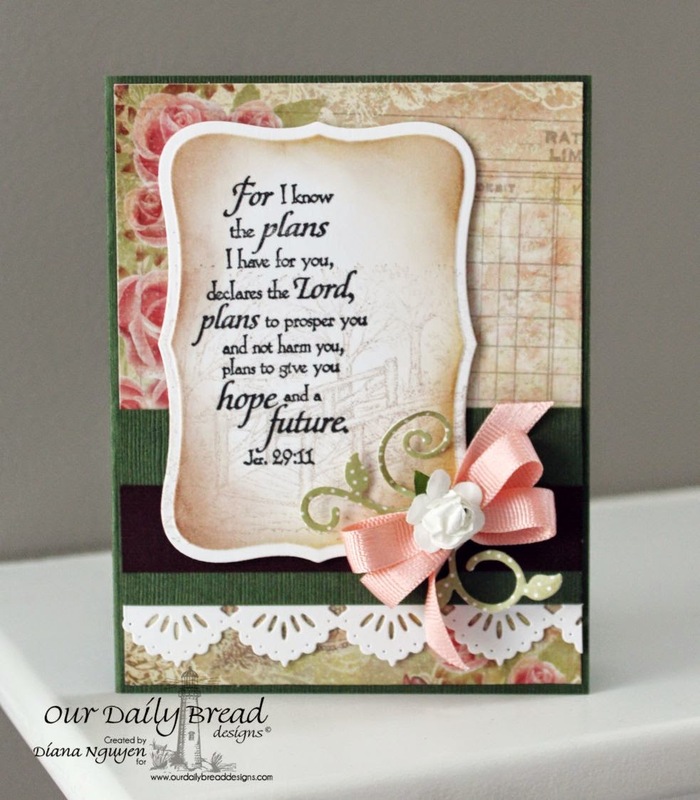 I so love your choice of papers, your shading around the beautiful verse and your added ribbon and border. So elegant my dear friend!! So lovely!! What a wonderful verse and you've surrounded it so beautifully with your sponging and beautiful paper!! My favorite verse!! I love all you sweet, soft colors, border and the beautiful bow!! Lovely card my friend! Oh, Diana, what a beautiful card, and I love your take on the sketch! So soft and beautiful, and I love your Beautiful Dies border with the ribbon and flowers! And what a comforting Scripture verse indeed - a favorite! Yes, I'm sure it is heartbreaking for the girls, and we trust that they will be comforted by these words from God. Hugs, sweet and dear friend! What a beautiful card, Diana. I'm sure this card will be a blessing and a comfort, and you're so thoughtful to make this for them. It's always such an incredible blessing to me when you share your amazing art work in our challenges, and I want you to know how very grateful I am. May God bless your week, and I hope to see you again very soon. So lovely Diana! I think it's such a perfect scripture of comfort and hope for Deborah and Rebekah. Such a wonderful verse and your card is so beautiful. I love your choice of colours and the little foliage with the bow and flower. So sad to hear but praying that these girls may be comforted by our loving heavenly Father.